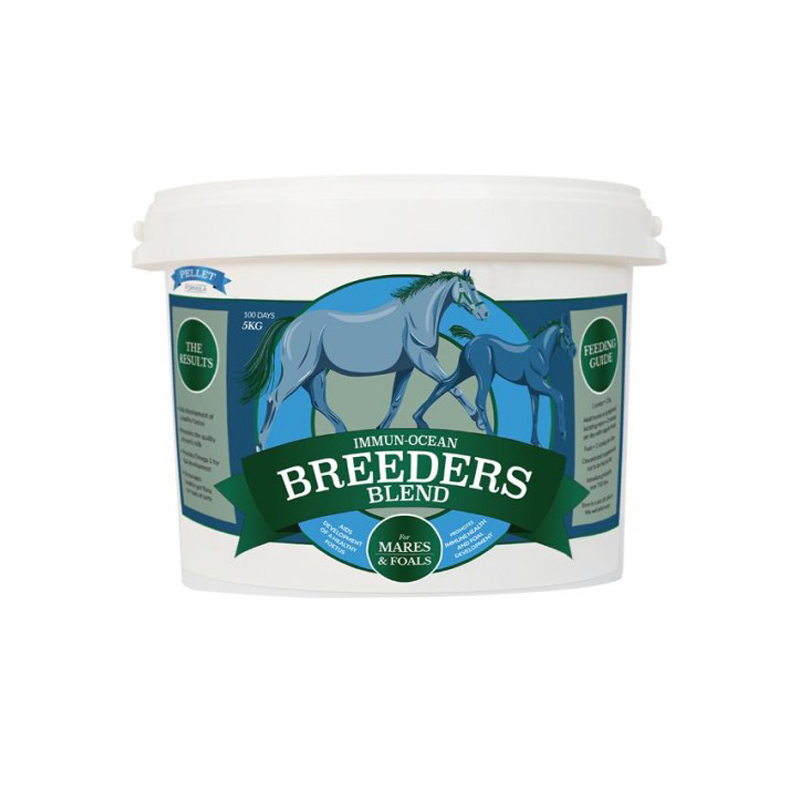 Breeders Blend is a natural feed supplement, comprising of Ascophyllum nodosum and Lithothamnium, which is specially formulated for broodmares and their foals. It provides a balanced blend of vitamins and minerals, which support the overall health of the mare, encourage healthy embryo development and may improve fertility and conception rates. It also helps to establish healthy gut flora in newborn foals. Breeders Blend contains flax oil, which provides an excellent source of ALA, a long chain essential fatty acid and precursor of eicosanoids, including EPA and DHA, which also play a key role in the development of the healthy foetus and the quality of the mare’s milk. This supplement is 100% natural and contains a balanced mix of minerals, vitamins, amino acids and antioxidants that help to promote a healthy immune system and aid the overall wellbeing of broodmares and young foals. Available in 5kg tubs, in both powder or pellet form. Lithothamnium, magnesium oxide, yeast, live yeast, macro algae, flax oil, ascophyllum nodosum low temperature dried granules, calcareous marine seaweed (lithothamnium) spp and other minerals.Cadmium 0.32 mg/kg, Copper 15000 mg/kg, Fluoride 170 mg/kg, Iodine 330 mg/kg, Lead 0.27 mg/kg, Mercury 0.03 mg/kg, Magnesium 15000 mg/kg, Molybdenum <3 mg/kg, Nitrogen 1.10 %, Phosphorous 1100 mg/kg, Potassium 1100 mg/kg, Selenium <3mg/kg, Zinc 160 mg/kg.